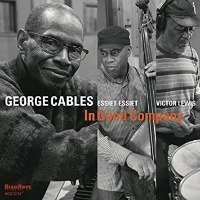 The “Company” of the title refers to more than Cables’ trio members, bassist Essiet Essiet and drummer Victor Lewis. It alludes to four fellow pianists whose compositions he plays in addition to two of his own in this relaxed collection. At 70, Cables reflects the values of the jazz mainstream of which he has been a solid part. In decades of work with Art Blakey, Sonny Rollins, Dexter Gordon, Art Pepper, Joe Henderson and others he has been a respected sideman and leader. Between his lengthy opening exploration of “After the Morning,” a John Hicks waltz, and the concluding single chorus of Billy Strayhorn’s “Day Dream,” Cables interprets pieces by Duke Ellington and Kenny Barron. Sparked by Lewis, Cables’ “Mr. Anonymouse” is an adventure in kinetic energy. George Cables is one of those artists who can always be counted on to create music of substance, depth and creativity. “In Good Company” is another great recording in a string of great recordings. I particularly enjoy listening to his work with Art Pepper. Pepper called him “Mr. Beautiful.” Boy, was he right. I met George in a NYC lounge purely by accident. My wife and I were relaxing, spending time in the “Apple”, having a drink, so we invited him to our table for a chat and to tell him we enjoyed his playing. He was in fine pianistic form and played a varied repertoire. He displayed a charming and friendly personality. Glad to hear he’s alive and well. I’ll have to check out his latest CD. George Cables has been one of my favorite living jazz pianists for many years. Just ordered this new one you wrote about today. He has a fine series of CDs out on Steeplechase, as well as more recent releases on High Note and a few other labels. Thanks for pointing out this his latest recording.